Malvern Farmers Market shoppers are in for a special treat - Frecon Hard Cider - one taste and you'll know what I'm talking about. Hard ciders are fermented apple cider, producing an alcoholic beverage somewhere between a beer and wine. 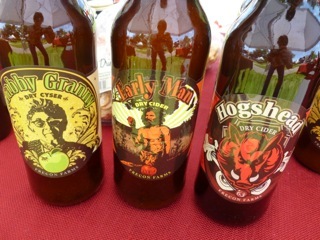 Frecon offers 3 different hard ciders: Early Man, Crabby Granny and Hogshead - buy a bottle of each to see which one you like the best. As good as this stuff is to drink, its also amazing in cooked dishes. Today I had some beautiful chicken legs and thighs scheduled for dinner - it was too rainy to grill them, so I decided to braise them - - - in Early Man Hard Cider. First, cook 4 slices of bacon, add 1/2 an onion, chopped, and 2 cloves of garlic, chopped; saute until translucent. Remove from the pan, drain excess fat. Crumble the bacon, and set aside with the onions. Liberally salt and pepper the chicken pieces. Add the chicken to the hot saute pan, skin side down. Allow to brown about 5 - 7 minutes. Carefully turn the chicken pieces over, skin side up, brown. Remove the chicken pieces from the pan. Pour 2 cups of hard cider into the pan, heat to a slow boil, add the onions, garlic and bacon. Add the chicken to the pan, skin side up. Cover the pan with a lid and transfer to a 350 degree oven for about 15 minutes to finish cooking. Remove the oven, and transfer the chicken piecesto a serving dish. 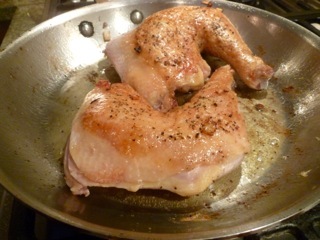 Cook the pan juices over medium heat for about 5 minutes to reduce, drizzle over the chicken, and serve. Hey - who ate the finished product - you have got to be kidding me! Seriously? All I can say is this braised chicken recipe was so delicious - it was gobbled up before we could even snap a photo of the finished dish. The best part - the cider sauce! Not a bit went to waste - we had bread on hand for sopping up all of the goodness! 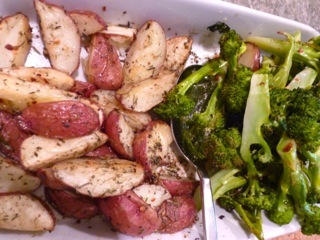 On the side - roasted new potatoes and roasted broccoli!